from a condition called cerebral palsy when she was 3 years old. but her father refused to accept this verdict, and decided to teach Deanie horseback riding, in order to strengthen her leg muscles. ride. 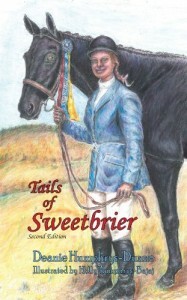 She didn’t settle on riding, she wanted to be a champion horseback rider. That required a lot of hard work and determination. Deanie was fortunate enough to be stubborn and persistent. She never quits, she never despairs. She keeps on going until she achieves her goals. This is an inspiring and empowering story. It’s told in simple tone, and I’m sure many kids would relate and identify with little Deanie. I like the pun in the title, it’s very clever. And I like the black & white drawings of Deanie and her horses. The horses are beautifully drawn.